The most important book ever written is, by far, Adam Smith's Wealth of Nations. It doesn't cost anything to read. A free book sure sounds like a great deal. But what happens if we don't use our money to reveal how much we love a book? Well, writers aren't mind-readers. If they can't see the true and actual demand for books, then the supply will invariably be really wrong. Does this mean that Smith's book shouldn't be free? No, it just means that we need a really good excuse to use our money to reveal our true love for it. This really good excuse is… ranking books with money. 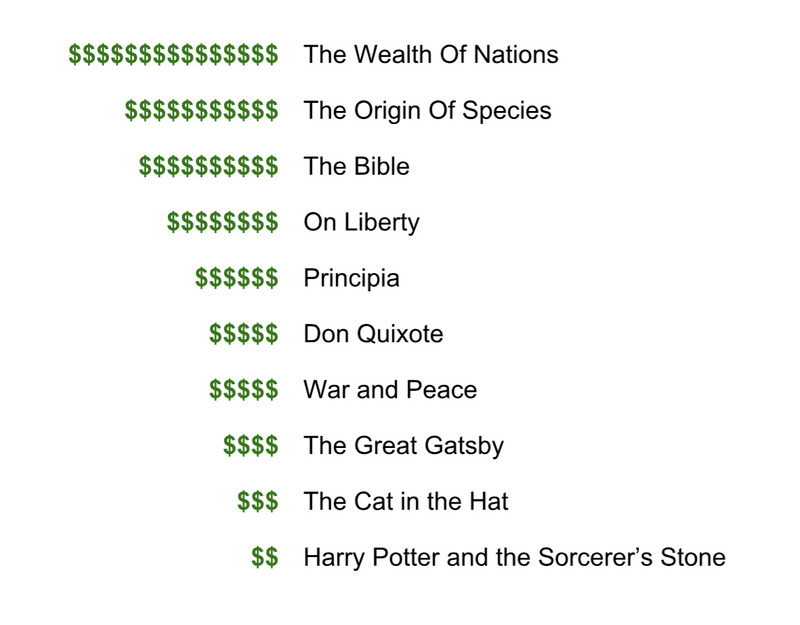 Right now there a few websites where you can use your money to rank books. I don't want to link to them, or name them, because I don't want to get accused of promoting them. To be clear, none of them are my website. Nor do I work for any of them. I'm simply a guy who really appreciates the concept, given that I've read The Wealth of Nations. On one of these websites you could post a question, for example, "Which is the best Sci-Fi book?" People could reply with a nomination (one per reply) that hasn't already been made. You could read through the replies/nominations and spend your money on the best ones. Everybody would be able to sort the replies/nominations by value. In theory the cream would quickly rise to the top. So what do you think? Does this make any sense? One objection that you might have is that this system would give too much influence to rich people. Well, if it truly is the case that J.K. Rowling, for example, shouldn't have far more influence than most people, then it would behoove us to figure this out sooner rather than later. Then we will be able to decide for ourselves which system is better at ranking books.